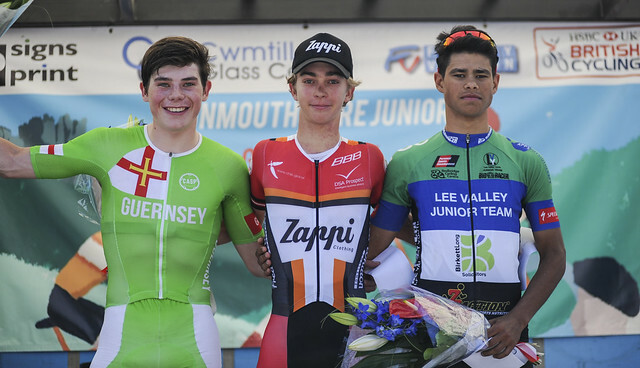 Mason Hollyman clinched his first victory in the HSBC UK | National Junior Series with a perfectly timed attack on the finishing climb from a select group. The Huddersfield-based Zappi Racing Team rider was part of an eight-rider group which formed in the last 12 miles of the gruelling 77 miles event in the Monmouthshire Junior Grand Prix. Hollyman made his winning move with 300m to go up to the finish in Grosmont and held off the chasers behind for a clear victory. “It’s my first National Series victory and it feels good as I’ve wanted it all season and knew I really wanted it today,” said Hollyman who now leads the Junior National Series overall. “I was quietly confident that I would have the legs at the finish although it wasn’t until I crossed the line that I knew I had it as I tried not to look back. The scenic and undulating lanes of Monmouthshire played host to round six of the National Junior Series. Straight out of neutralised it was Brecon Burnett (Cardiff Ajax) and Jack Ford (Wheelbase Cabtech Junior RT) who quickly pulled out a gap of over a minute on the windy roads. Ben Barlow (Spokes Racing Team) and Zach Bridges (Team Wales) went in search of the leaders but once onto the main road towards Abergavenny the bunch closed the gap and brought them back together with 16 miles gone. Once back onto the country lanes several riders tried to escape the bunch before a strong breakaway of four leaders quickly established a lead including Lewis Askey (Team Backstedt/Hotchillee), Dylan Westley (Giant Halifax RT), Joseph Rees (Team Wales) and Callum Macleod (Team Central Region). They quickly built up a lead of over a minute and were initially chased by Isaac Peatfield (Green Jersey RT) and Samuel Allen (Lee Valley Youth). As the road went uphill approaching the first passing of the finish line in Grosmont after 36.2 miles the chasers faded away and the bunch behind split into two groups. Askey sprinted clear to clinch the first King of the Mountains points in Grosmont and the pace was too much for Rees as the leaders were reduced to three riders. Over the top of the climb the first bunch had reduced their deficit to 35 seconds. However, as they hit the rolling terrain once again the trio extended their gap to back over a minute while Dylan Hughes (Spokes Racing Team) went in search of the leaders. After the first full lap of the 13.6 miles finishing circuit Askey took the second King of the Mountains points with 45 miles raced. However, once over the top their gap again shortened and with just over 20 miles left to race they were caught by a reduced bunch to form a leading group of 23 riders. Approaching the third ascent of the Grosmont climb Sam Culverwell (Guernsey Velo Club), Macleod and Samuel Beckett (Cardiff JIF) escaped the group and built up a lead of 52 seconds. Behind Hollyman forced the pace and with 12 miles remaining a group of chasers bridged across the gap resulting in a group of eight riders to contest the finish. Hollyman attacked half-way up the finishing climb into Grosmont and held on for victory while Alexander Tarlton (Lee Valley Youth Cycling Club) charged after him for second and Sam Culverwell (Guernsey Velo Club) held on for third. Macleod took the King of the Mountains competition and took seventh place overall. “The first 29.3 miles lap was all about saving my energy but there were a few dangerous riders up the road,” Hollyman added. “I knew I had to try and get it back so with one lap remaining (13.6 miles) and I got away at the top of the finishing climb and kept pushing until we caught them.